Raised in the Bowery of New York City in the summer of 1861, the 73rd New York Infantry was given the moniker of "Second Fire Zouaves". Dressed in a distinctive zouave-style uniform, the 73rd's soldiers appeared different from their counterparts in the "Excelsior Brigade", and they were. The regiment was composed almost entirely of volunteer firemen from New York City and its boroughs, men who enlisted as volunteer soldiers with the assurance that they would still be carried as active firemen on the rolls of volunteer fire departments back home. (The organization of New York City Volunteer Firemen began in 1658 and lasted until 1865, when the control of fire departments in New York was taken over by the city administration) The regiment went to Washington in October 1861 where it was presented a stand of colors (flags) donated by the fire departments of New York City. "Not far from our regiment's position, several guns that had made havoc among the advancing Confederates were in imminent danger of being taken. A caisson had been blown to atoms, the horses killed and most of the officers and men killed or wounded. As our line began to retire a mounted officer implored us... to save his guns. Amid the sounds of bursting shells, cheers mingled with shouts, and the general confusion of the moment, it was almost impossible to hear or be heard. At what I mistook for the consent of (Major) Burns... I called for the men of my company and those nearest me to follow me with the mounted officer and drag away the imperiled guns. A minute later a shell burst...a fragment wounded me in the ankle and what felt like burning powder entered my left eye. Our line now in considerable disorder retired (and) for a few minutes were in a perfect tornado of bullets and shells from both friends and foe, the open field affording no shelter. At last the enemy came hard upon us. As the center of the 13th Mississippi passed over me, the men firing and shrieking like Indians, a volley from our side tore through (their) ranks and some of the Confederates fell. I had never in my experience seen such havoc from a single volley and its effect was instantly manifested (as) the line of battle came to a halt without command and it took the utmost exertions of the (Confederate) officers to prevent panic." What remained of the 73rd New York participated in a stubborn withdrawal by the division to Cemetery Ridge. Partially funded by the state of New York and city firemen, the monument to the 73rd New York Infantry was dedicated on Saturday, September 4, 1897 and bears the inscription, "Erected at the instance of Volunteer Firemen of the City of New York... in grateful recognition of the service rendered by the Second Fire Zouaves on this field in defence of the Union July 2, 1863". At the dedication ceremony, General Henry Tremain said, "The volunteer firemen never failed to risk life to save life, or risk life to save country. That men associated in civic life for such exigencies should make good soldiers does not seem strange. 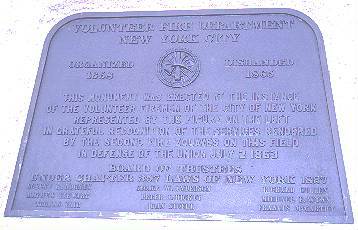 No honor could be greater to the volunteer firemen of New York than this monument- except the honor of the work done by their representative regiment, the Second Fire Zouaves, on this and other battlefields." The monument was designed by the architectural firm of Hoffman and Prochazka of New York, and the bronze statues are the work of New York sculptor G. Moretti, who also sculpted the statue of Commodore Vanderbilt that stands on the campus of Vanderbilt University in Nashville, Tennessee. 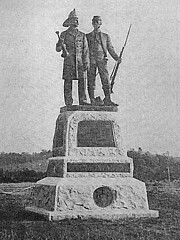 At the time of its dedication the monument was valued at $15,000.00. The spirit of those firemen-turned-soldiers remains alive to this day, embodied in the courage, skill and determination of the firemen and policemen of New York City who responded to the terrible events that changed the face of that city and this nation on September 11, 2001. Sources: National Park Service; Gettysburg National Military Park. The five-foot tall soldier's true identity was that of a simple young farm girl from central New York named Sarah Rosetta Wakeman. Her letters, the only such correspondence known to exist, provide a rare glimpse of what life was like for a woman fighting as a common soldier in the Civil War under the guise of a man. Written shortly after she left home to pursue her fortune in 1862, Rosetta's letters over the next two years tell of army life in the defences of Washington, D.C. and on the march and in battle during the 1864 Louisiana Red River Campaign. She wrote frequently to her family in Afton, NY, and her letters contain feelings and observations like those expressed by the majority of her fellow soldiers. We read of her determination to perform honorably the duty required of a soldier, the trials of hard marching and combat, her pride in being able to "drill just as well as any man" in her regiment, and her eventual fatalistic attitude toward military service, and her frequent expressions of faith in God and the afterlife. Although Rosetta did not survive the war, her letters remain as a singular record of female military life in the ranks, a phenomenon largely ignored by historians and researchers. Private Wakeman was not alone in embarking on her strange adventure. Hundreds of women, from both the North and South, disguised themselves as men and enlisted in the armies of our nation's bloodiest war. The experiences of these women during the Civil War are just beginning to be recognized as elemental to understanding the life of this country during those turbulent times. Little is known about these women precisely because they enlisted and served in constant secrecy, fearful of revealing their true identities. This unique collection of letters offers a firsthand look at the personality and character of a woman who defied convention to take a man's place in the Union army. The full co-operation of the present-day 69th New York National Guard helped make possible the compilation of this detailed account, which includes 13 period maps and 270 illustrations, many of them rare photos from private collections. The original hardcover limited edition of Bilby's book, however, quickly sold-out to re-enactors, veteran and active members of the 69th Regiment, and hard-core Civil War collectors; the Combined Publishing trade paperback is the first edition made available directly to the general public. Joseph G. Bilby is a popular columnist for the Civil War News and a veteran of the current 69th Regiment. He is also the author of Civil War Firearms. Despite losing more than half its strength in that battle, the 134th went on to play a significant role in the relief of Chattanooga, the capture of Atlanta, Sherman's March to the Sea, and the invasion of the Carolinas. About the Author: George Conklin has been researching the 134th New York and the Battle of Gettysburg for several years. His articles on the subject have appeared in several history journals, including the Gettysburg Magazine. From Chancellorsville, where General Robert E. Lee launched his high-risk campaign into the North, to the Confederates' last daring and ultimately-doomed act, forever known as Pickett's Charge, the battle of Gettysburg gave the Union army a victory that turned back the boldest and perhaps greatest chance for a Southern nation. Although it's called a guide to Gettysburg, in my opinion, it's an authoritative guide to the Civil War. Any history buff or Civil War enthusiast or even that casual reader should pick it up.